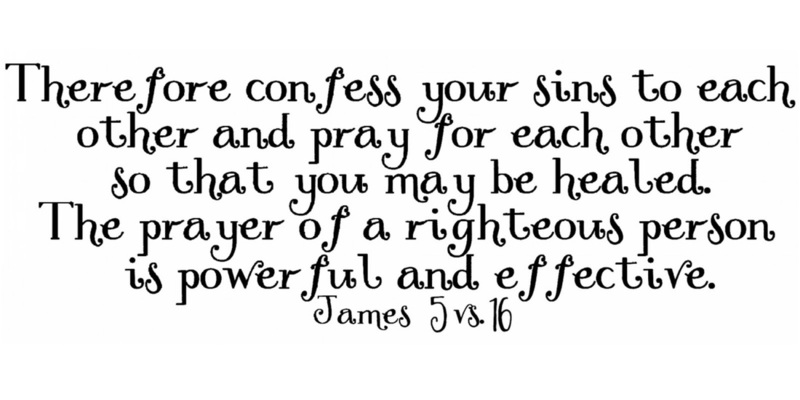 Sincere prayer helps us establish a personal relationship with God. Making prayer a daily practice can help us perfect that relationship—and it can help us perfect ourselves. 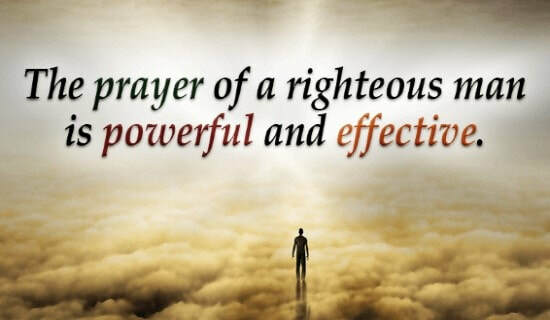 ​Whether we pray aloud or pray silently in our hearts in fleeting moments of need, prayer is a personal form of communication where we can speak directly with our Father in Heaven. He knows each of us by name and loves us. He hears our prayers and He answers them with wisdom, empathy, and compassion. Sometimes those answers come in very direct, concrete ways, but other times they come more subtly, through impressions, promptings, or feelings of peace. We can go to our Father with desperate questions, with humble confessions, or with gratitude; we can pray to better understand Him and His plan for us. 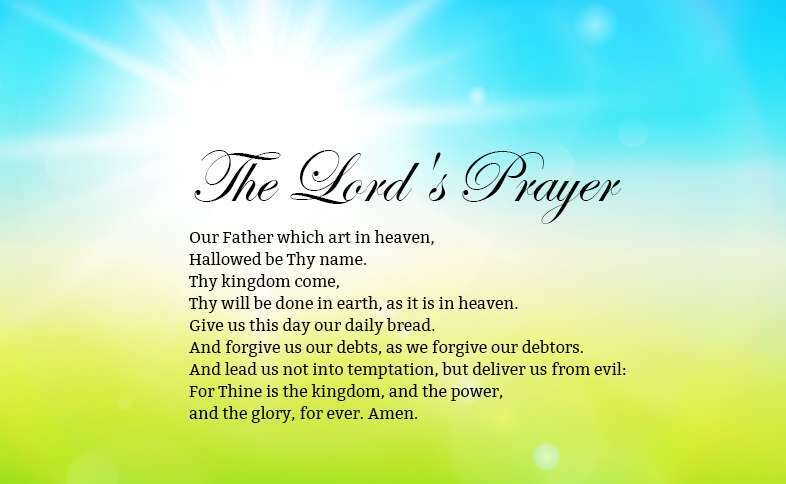 If you would like to post a prayer on our page just post your request. ​Lord, help me not to lean on my own understanding but in everything acknowledge You so that You can direct my words, thoughts and actions. In Jesus’ Name, Amen. ​ Our prayers may be awkward. Our attempts may be feeble. 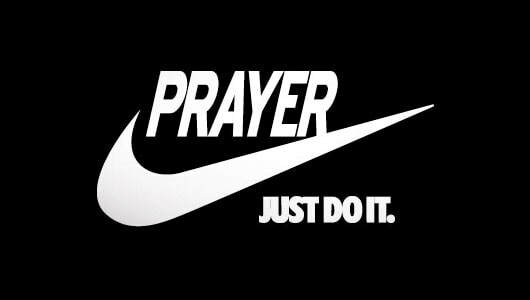 But since the power of prayer is in the one who hears it and not in the one who says it, our prayers do make a difference. Lord God, we stand before your presence. Look in mercy upon us poor, weak children, who do not know where to turn unless you help us with your mighty hand. We trust in you. You will help us, you will always be with us, and even in hard times you will accomplish your will for what is good. Bless us today as we gather to hear your Word. May your Word always be our strength and joy. Your Word gives victory in us and in the whole world so that your will may be done on earth as in heaven. Amen. "Lord, may nothing separate me from You today. Teach me how to choose only Your way today so each step will lead me closer to You. Help me walk by the Word and not my feelings. Help me to keep my heart pure and undivided. Protect me from my own careless thoughts, words, and actions. And keep me from being distracted by MY wants, MY desires, MY thoughts on how things should be. 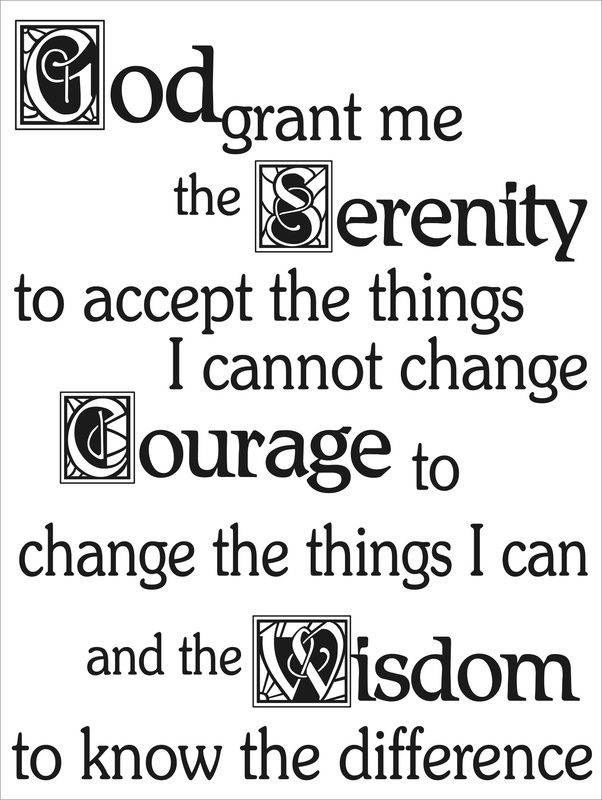 Help me to embrace what comes my way as an opportunity... rather than a personal inconvenience. And finally, help me to rest in the truth of Psalm 86:13, 'Great is your love toward me.' You already see the ways I will fall short and mess up. But right now, I consciously tuck Your whisper of absolute love for me into the deepest part of my heart. I recognize Your love for me is not based on my performance. You love me warts and all. That's amazing. But what's most amazing is that the Saviour of the world would desire a few minutes with me this morning. Lord, help me to forever remember what a gift it is to sit with You like this. Amen." Holy Lord, Thank You for grace. Please help me move beyond the hurdles that trip me up and give me the strength and wisdom to look up and see the hope I run toward in Christ. In Jesus’ Name, Amen. We pray for our Bishops, we remember especially our Primus, Bishop John Fenwick, give him the strength and wisdom as he leads this denomination, and pour upon him blessings from above. We also remember Bishop Paul in his role as General Secretary, may he know that your hand is upon him and may he be filled with your peace in his quiet times. Guide and protect him and surround him with Your love. In Jesus' Name, Amen. We pray God that you will bring the United States of America back together and as a nation so it will be no longer be divided and you will bring this nation to know you as you are. Make this country great again in Jesus' name. May this country be strong again rich in your word that everyone will know the truth of who you are as a loving and meek God and one who is just not a God of Judge but a God of peace. Let everyone feel your love and show them your ways through your Holy Spirit and show them your Glory in ways that no one can deny who is guiding this country of LAND OF FREE AND THE BRAVE! 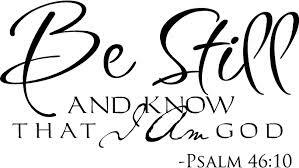 Let everyone who has breath praise and humble themselves before you with meekness and truth of who you are. Loving God, Your Son told his disciples to become like little children. Lead us to work for the welfare and protection of all young people. May we respect their dignity that they may flourish in life, following the example of the same Jesus Christ our Lord. AMEN. whose Son Jesus Christ exchanged the glory of a heavenly throne for the form of a servant, we thank you that you have given Elizabeth our Queen a heart to serve her people, and have kept her devoted in this service beyond all who were before her: encourage us by her example to serve one another, and to seek the common good, until you call us all to reign with Christ in your eternal kingdom. Amen. Heavenly Father, Can you please tell my son I love him and miss him. Please tell him I need his forgiveness. I place him into your hands for save keeping. In Jesus' Name. AMEN. You have given us grace at this time with one accord to make our common supplication to you; and you have promised through your well-beloved Son that when two or three are gathered together in his Name you will be in the midst of them: Fulfill now, O Lord, our desires and petitions as may be best for us; granting us in this world knowledge of your truth, and in the age to come life everlasting. Amen. 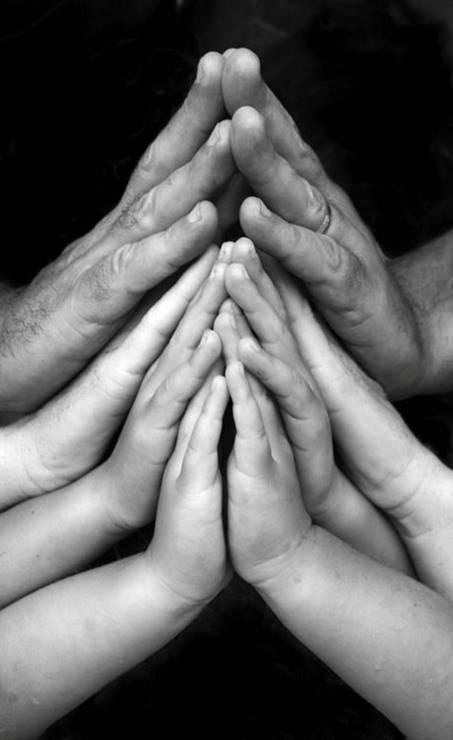 We give you thanks for the many answered prayers for our friends and loved ones. We ask your blessing upon the whole of our congregation of St. Andrew's. Send down your Holy Spirit upon us and fill us anew. 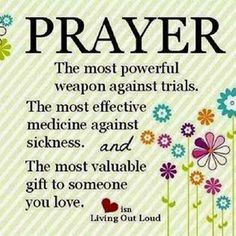 Lord help those people who are under going treatment for cancer or any other illness, let them know you are by their side, we ask this through Christ our Lord. Amen. We pray for our brothers and sisters in Christ in Russeville, Kentucky. Send your Holy Spirit upon them during their missionary work out in Brazil. May you touch the hearts of all those people they come into contact with and may the seeds of love be planted deep within their hearts. Truly bless them and keep them save in their work for you Lord. Lord, my heart is broken but You are near. My spirit is crushed, but You are my rescuer. Your Word is my hope. It revives me and comforts me in especially now. My soul faints, but you are the breath of life within me. You are my help, the One who sustains me. 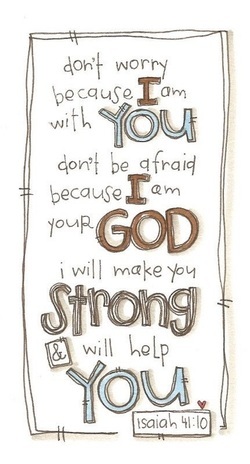 I am weak but You are strong. You bless those who mourn, and I trust You to bless me and my family with all that we need. You will rescue me from this dark cloud of despair because You delight in me. In Jesus’ Name, Amen. Father, thank you for our salvation in Christ. Our Saviour taught us to love You, and to love others but we are miserable sinners and fail You and our dear Saviour daily in this simple task. Lord help us to love You with our whole hearts, soul, mind and strength and others as ourselves. Help us to love our enemies, to do good to those who mistreat us, seeing in them image of our Creator and remembering the love of God towards us in that while we were yet sinners, Christ died for us. Help us to shine the light of joy Christ gave us to the world we have contact with on a daily basis. Lord, be merciful to me a sinner. Amen. ​Lord, grant me tenacious winsome courage as I go through this day. When I am tempted to give up, help me to keep going. Grant me a cheerful spirit when things don't go my way. And give me courage to do whatever needs to be done. 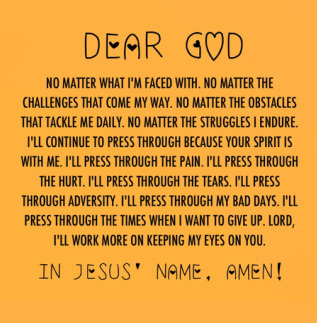 In Jesus' name, Amen." Please be with all those people suffering with Breast Cancer. Give them comfort this day we ask. Be with all their families and help them to be strong. begin with you, O Lord. ALMIGHTY God, who hast given us grace at this time with one accord to make our common supplications unto thee; and dost promise, that when two or three are gathered together in thy Name thou wilt grant their requests: Fulfil now, O Lord, the desires and petitions of thy servants, as may be most expedient for them; granting us in this world knowledge of thy truth, and in the world to come life everlasting. Amen. Dear Lord, I lift Your Name on high. Thank you for the many blessings I receive at your hands, for keeping watch over me and protecting me each day from mine enemies. I love you Lord! Thank you for loving me. Amen. Thank you for another chance, comfort those who are weary and heavy at heart. Encourage them to keep pressing through to victory. Remind them that you are faithful and that their harvest is coming/ Life gets hard sometimes but your righteous right hand is always on us. In my weakness there I find my strength in you. I am anointed. I am equipped. I am empowered. Lord, you are Holy above all others, and all of the strength that I need is in your hands. I am not asking, Lord, that you take this trial away. 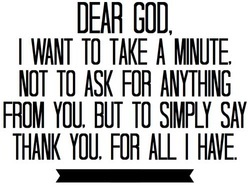 Instead, I simply ask that Your will be done in my life. Whatever that means, that is what I want. But I admit that it's hard, Lord. Sometimes I feel like I can’t go on. The pain and the fear are too much for me, and I know that I don’t have the strength on my own to get through this. I know that I can come to you, Jesus, and that you will hear my prayer. I know that it is not your intent to bring me to this point just to leave me in the wilderness alone. 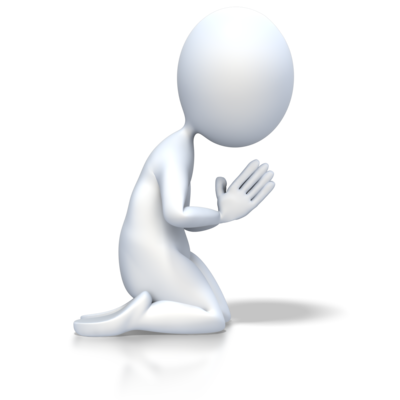 Please, Lord, give me the strength that I need to face today. don't have to worry about tomorrow. If you just give me the strength that I need today that is all I need. Keep me from sinning during this trial. Instead, help me to keep my eyes on you. You are the Holy Lord, and all of my hope rests in you. Thank you for hearing my prayer. In Jesus' name. Amen. God of compassion, your love for humanity was revealed in Jesus, whose earthly life began in the poverty of a stable and ended in the pain and isolation of the cross: we hold before you those who are homeless and cold especially in this bitter weather. Draw near and comfort them in spirit and bless those who work to provide them with shelter, food and friendship. We ask this in Jesus' name. Amen. Remind us again and again of what you have done in our hearts and lives to make us certain of the resurrection. Help us to live in this certainty and to hold fast to everything good and great which you bring into our lives. Grant us the assurance that we are gaining ground in the battle for the redemption of those who are still in darkness and in the shadow of death. May we find joy in what we have here and now. Give us patience in our struggles. Give us hope for all that has gone wrong, because even what is in darkness is still in your hands. In the end everything must be brought to the light so that all humankind may glorify your great name. Amen.